TIP: To find out which browser version you're using, click your browser's Help menu, and select About Internet Explorer or About Navigator or About Communicator. 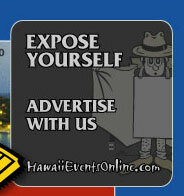 NOTE: Next time you open up your browser, HawaiiEventsOnline.com will appear first. When visiting another site, click your browser's Home button to return to HawaiiEventsOnline.com.